In 2017 Ellicott Dredges, a Baltimore, Maryland (USA) dredge manufacturer delivered a Series 460SL Swinging Dragon® dredge to a customer near Puerto Vallarta, Mexico. 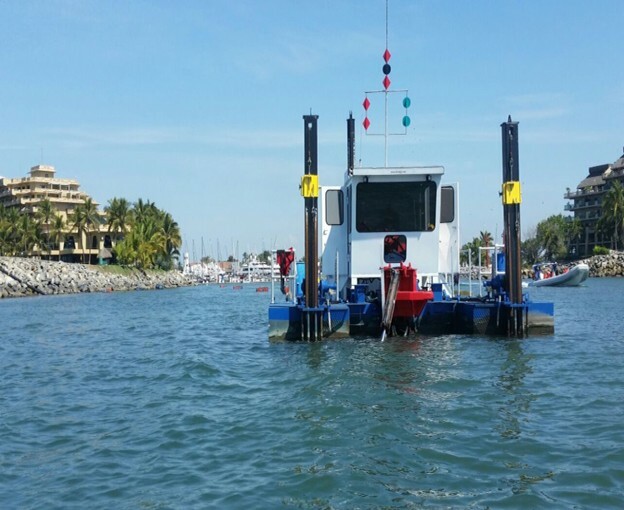 The heavy-duty dredge is currently being used to remove sediment from a local marina and navigational channel that connects directly to the Pacific Ocean. The customer selected the 460SL Swinging Dragon® dredge because of the small dredge’s ability to operate in and narrow and limited spaces. in areas such as boat slips and maintain the necessary channel depths required for larger vessels such as private yachts to safely travel back and forth without hitting aground. This versatile dredge has a built-in spud carriage that advances the dredge quickly and accurately. Whether operating in narrow channels in the swinging ladder mode or switching to conventional dredging mode for wider dredging cuts, this dual function dredge provides the dredge operator with the ability to maximize their dredging productivity. For additional help selecting the right type of marina dredging equipment for your project complete our project questionnaire today or email us at sales@dredge.com.